I keep bees. For the most part beekeeping is relatively hands-off—the bees go about on their tiny day-to-day missions of glory and adventure, and I stand at a respectful distance and watch them. Occasionally, however, we have an adventure together. For instance, the other day I had to go measure them. More specifically I had to measure the ratio of parasitic mites in my hive. Mites are small, flat, and red. They specialize in spreading diseases and will invariably wipe out an entire colony if the mite population gets too high. Of course, nobody wants mites around but when I first heard about doing a “mite check” I was a little skeptical. First, I had been made fully aware by a number of beekeepers that although preventative measures can be prescribed, there is little to be done in terms of long-term mite management. Second, the idea of literally measuring out half a cup (three hundred) bees, putting them in a jar of rubbing alcohol, and counting the number of mites that fall off the bees seemed rather bizarre honestly. But after listening to the conversations of several beekeepers on the subject, I came to understand that the idea behind a mite check is to have a scapegoat for when a colony fails. Naturally, I wanted a scapegoat too, so I grabbed my hive tool and zipped up my full-bodied bee suit. There is nothing especially attractive about beekeeping suits (although there is a growing beekeeping fashion market), however, as an amateur beekeeper I have been concentrating more on the fundamentals—such as securing a scapegoat—than on fashionable apparel. For this reason, I have an ordinary white beekeeping suit—only, it doesn’t look normal when I wear it. You see, my dad originally bought this suit so that it would fit both of us. The only problem with this is that my dad is 6’3”and I am only 5’7”, so whenever I wear it I look like an enormous deflated marshmallow. It’s pretty embarrassing, but fortunately the neighbors don’t live too close. So, there I was, a giant deflated marshmallow walking out to my beehive, ready to measure some bees. I pried the lid off the hive and some of the bees flew up to inspect me, gaging whether or not the person ripping the roof off their home was a threat. Now this was the delicate part, I needed three hundred bees to conduct the test, but I couldn’t just pluck them out of the hive one-by-one and expect them to stay put until I had half a cup. Instead, I was going to capitalize on the element of surprise. Making sure not to disturb them, I painstakingly withdrew a frame from the hive, it was heavy and covered with little furry bee bodies that milled about confusedly in the sudden sunlight. And then I banged the frame down into a small shallow tub that I had brought along. Now I had read that if you’re lucky the bees will all fall off at once into a complex, wriggling, disoriented mass, but if you’re unlucky you will stand there for a moment after you have half-heartedly banged the frame down and then, with your measuring cup hanging loosely in your hand, you will watch as individual bees claw over one another, shake back their antennae and flex their wings with a determined glint in every pair of eyes. I was unlucky, probably because I had just violated one of my last innate instincts of survival—to not provoke stinging insects with irascible temperaments. Of course, I had on my deflated marshmallow suit for protection, but still, the audacity of what I had just done was rather overwhelming. Not because I had just made three hundred bees angry, but because I had a hive of twenty-five thousand bees. Twenty-five thousand bees which were now thronging around my head in a golden haze of righteous indignation with the unified purpose of wriggling into my deflated marshmallow suit and stinging me to death. While I was calculating how many stings it would take to kill me, most of the bees had crawled out of the tub and were now in the air. Fortunately, my desire to survive was still strong—I wasn’t about to start over—so I grabbed the tub and half-poured half-scooped the bees into my measuring cup. I had maybe an eighth of a cup. I didn’t want my eighth of a cup to fly away so I held my gloved hand over the top of the measuring cup, this, however, proved to be a problem. As I was preparing to transfer the bees to the jar of rubbing alcohol, the bees had mostly transferred themselves to the palm of my hand. I did my best to brush them into the jar but at this point it didn’t matter anymore—the air was thick with bees, bees flying into the jar, bees flying out of the jar, bees pacing back and forth on my face mask, wrathfully waving their tiny bee-legs through the holes—I began to doubt whether or not I would ever survive. I took me a half hour of walking around the yard before they left me alone. And then it took me another half hour of walking around the yard before I was convinced that they had left me alone. However, I did eventually get to examine the results of the test—once I was sufficiently certain that the buzzing I heard was only my imagination and I had finally ventured to get out of my deflated marshmallow suit and run into the house. I was going to need that scapegoat—the mite level in my hive was above the acceptable threshold. 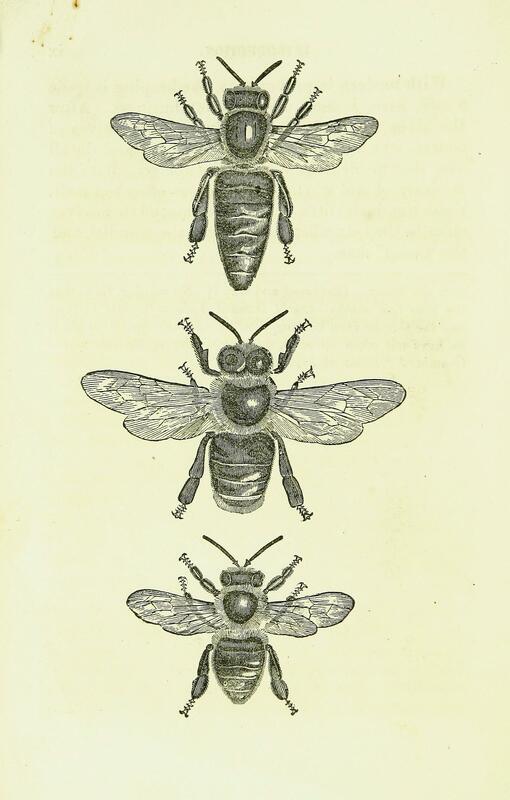 But here’s the great thing about beekeeping—the rules are always changing. I did some more research and learned that if I were to administer preventative measures soon and apply them regularly, in all probability my colony would survive—that is, as long it didn’t starve, or freeze, or get mauled by a bear. I keep bees. Its relatively hands-off—the bees go about on their tiny day-to-day missions of glory and adventure, and I sit close by and watch them. Johanna Bulley keeps bees in the state of Maryland but often finds herself in a different state while writing. She is an editor of Hedge Apple Magazine.